Today, creators of the Transborder Immigrant Tool announced the release of their book containing the code and poems that power this inventive and potentially life-sustaining tool. Developed by the Electronic Disturbance Theater while in residence at B.A.N.G. 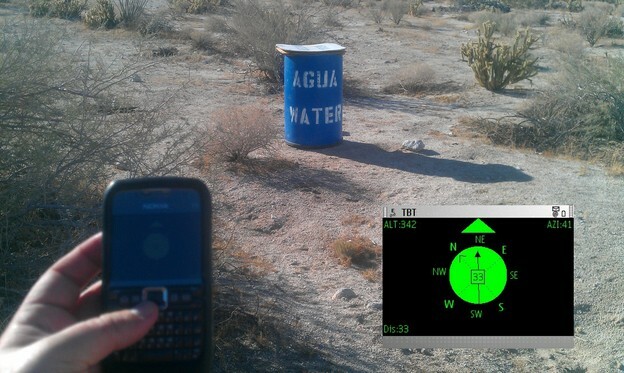 lab at University of California, San Diego, the Transborder Immigrant Tool is a mobile app developed for use on inexpensive phones that offer immigrants crossing the U.S./Mexico border on foot navigation to water stations in the desert using visual and sound cues. Once a traveler activates the app, the phone locates the nearest water cache using GPS and begins guiding the user towards the water using a compass and poems. J-shaped tracks across the desert dunes. Like this poem, the others blend survival tips with imagery that evokes nature and the desert. The Transborder Immigrant Tool situates itself as a form of electronic literature within the larger, rich tradition of literature of the U.S./Mexican border, evoking writers like Gloria Anzaldúa. Moreover, the tool exemplifies what artist/theorist micha cárdenas calls a "Science of the Oppressed": an effort to reimagine knowledge production from outside dominant cultural paradigms and with an eye towards decolonization and social justice. The tool demonstrates the possibilities of such an approach by repurposing technologies that may be otherwise seen as obsolete towards emancipatory ends. In doing so, the tool transgresses not only borders but also genres, nations, and the law as it offers aid and comfort to those traveling under duress in the borderlands.